Victoria Beckham is this month's British Vogue cover girl. That itself is old news. Done, written about and tweeted to the world. However, British Vogue are continuing to drum up interest in the cover by slowing releasing multimedia to support the new issue. Case in point, today's release of Victoria Beckham's behind-the-scenes footage from the photo shoot. Warning: you will want to buy the issue after seeing this. 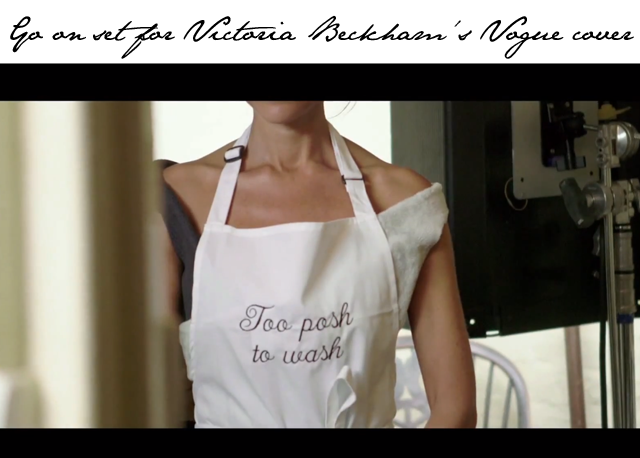 First off, we see Victoria Beckham admit she would love to be Vogue's Lucinda Chambers. Get in line, lady. Everyone wants to be this amazing fashion visionary. If that isn't enough, you also get a look at Posh Spice sporting dirty garden gloves, massive wellies, a custom made hat that looks like it's made for the scarecrow and a specially embroidered apron. Bottom line, you want to watch this. Enjoy.